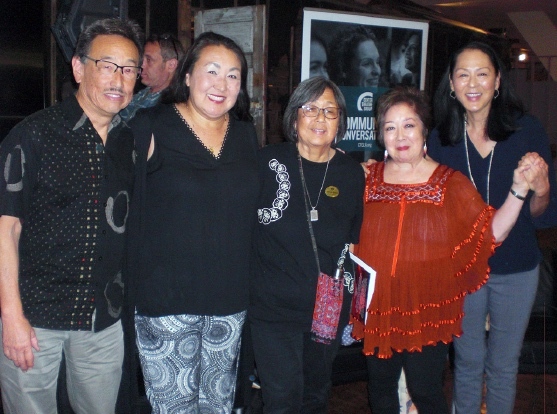 “Stand Up for Justice,” a docudrama co-produced by Nikkei for Civil Rights & Redress and Visual Communications in 2004, was screened Nov. 5 at the Japanese American National Museum by Center Theatre Group in conjunction with the opening of Luis Valdez’s “Valley of the Heart” at the Mark Taper Forum. The film tells the true story of Ralph Lazo (1924-1992), a Mexican American who was so upset by the incarceration of his Japanese American friends at Manzanar in 1942 that he decided to join them there for two years. The play is also about the relationship between Japanese American and Mexican American families during WWII. Speakers included (from left) John Esaki, director of “Stand Up for Justice” and vice president of programs at JANM; Kiyomi Emi, a member of the CTG marketing team and granddaughter of Frank Emi, co-founder of the Heart Mountain Fair Play Committee; Kathy Masaoka, an NCRR member who is currently involved with Nikkei Progressives, Vigilant Love and the Sustainable Little Tokyo Project; Miya Iwataki, redress activist, poet and Rafu Shimpo columnist; and moderator Leslie Ishii, a director, actor and arts educator. This event was part of the Community Conversation series. For more information, visit http://CenterTheatreGroup.org.